What Is Bit by Bit Blu-ray Copy? Since Blu-ray Disc has been strongly welcomed by majority of video enthusiasts, people’s desire to collect Bl-ray Disc has also upgraded gradually. During the process, you may be upset about the high price of Blu-ray Disc which makes it little possible to be convenient to share with others. Under the circumstances, various Blu-ray copy software have blossomed on the go. With a piece of Blu-ray copy software, without any doubts, you can obtain a new copy of Blu-ray Disc easily. However, the questions is that the quality of the copied Blu-ray Disc is not so superior as the original one. In other words, it is not a Blu-ray bit by bit copy. What is the definition of Blu-ray bit by bit copy? Actually, a bit by bit copy is a copy where each bit of the copy is identical to the original one. Blu-ray bit by bit copy will make an identical new disc to the original one whose video quality is also superior. However, not all the Blu-ray copy software have such a function. Next, I will list several Blu-ray bit by bit copy software for your reference. Among them, I will strongly recommend Leawo Blu-ray Copy for you. Leawo Blu-ray Copy offers you the best solution to copy Blu-ray movie and copy DVD movie without quality loss. It could also allow you to 1:1 copy Blu-ray movies in forms of disc, folder and ISO in 6X faster speed. It can also copy Blu-ray disc in 1:1 disc to disc duplication with subtitles and audio tracks retained. With Leawo Blu-ray Copy, you will be able to make perfect 1:1 Blu-ray clone from the Blu-ray Disc to backup of DVD-9 and DVD-5 discs. For more detailed instructions, please go ahead to refer to the following. Step 1. Download Leawo Blu-ray Copy and install it. Step 2. Insert a blank Blu-ray disc to your computer’s disc drive. Step 3. 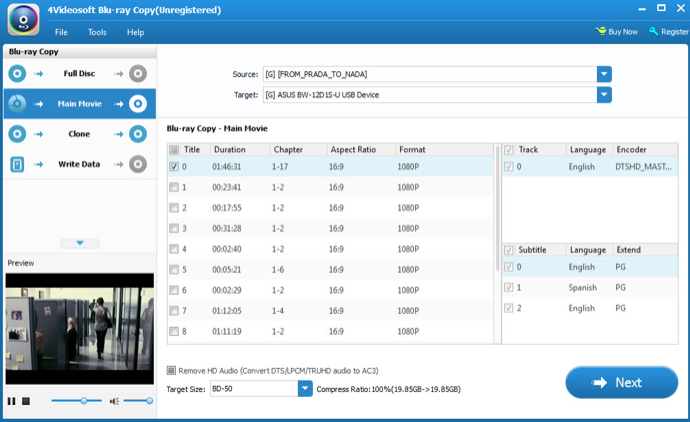 Import the Blu-ray video to the main interface of Leawo Blu-ray Copy. You can click Add Blu-ray/DVD button or just simply drag the Blu-ray file to the interface. Step 4. Set the Blu-ray settings. After loading, you will need to select video mode (Full Movie, Main Movie and Custom Mode), Subtitle and Audio Tracks at the bottom. Step 5. Start copying Blu-ray movie file to the blank disc. 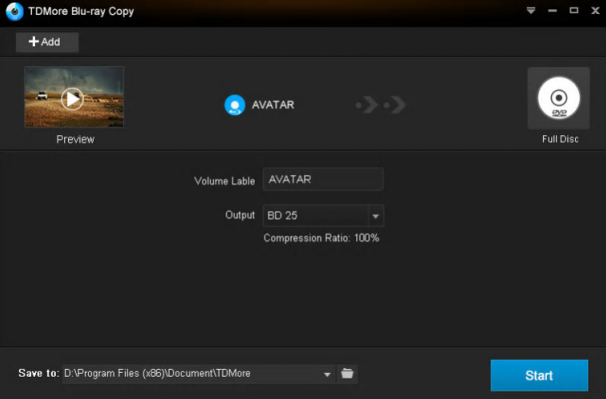 Before copying, you will need to set the “Copy to”, “Disc Label”, “Save to” parameters. Then click Copy button below to start. Leawo Blu-ray Copy would start to back up Blu-ray file and finally you will get a new Blu-ray bit by bit copy immediately. With this Blu-ray copying program, you will be easy to get an Blu-ray bit by bit copy in an easy and efficient way. This Blu-ray Copy is a basic Blu-ray copy program. It can help you to copy a Blu-ray Disc bit by bit. Also, it could digitize your physical media library. But some of the codec options are confused for users. And the Blu-ray copy process is a bit lower than other programs. 4Videosoft Blu-ray Copy is a good Blu-ray copy software that can easily copy Blu-ray in 1:1 ratio. It has a very simple interface which is easy for primary users to handle. It can not only provide Blu-ray bit by bit copy, but also help you to backup Blu-ray Disc to hard drive with high quality. But it lacks the customized features. And the copy speed is not so fast as Leawo Blu-ray Copy. Therefore, with its advanced Blu-ray copy technology, Leawo Blu-ray copy could offer you the best Blu-ray bit by bit copy. 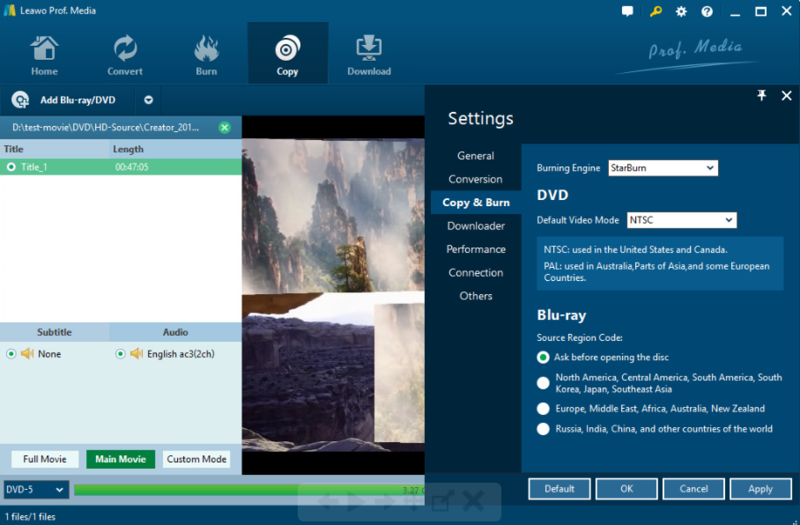 Leawo Blu-ray copy is also a superb 3D Blu-ray copy software app that could copy Blu-ray 3D disc in 1:1 disc to disc duplication. Under 1:1 disc to disc Blu-ray shrink mode, all 3D effect would be maintained.Don’t hesitate! Just download and take a try! Regarding some other tricks that you can use during the Blu ray copy process, for example, backup Blu ray with subtitles in 2 different ways, please check the related tutorial link for more details.